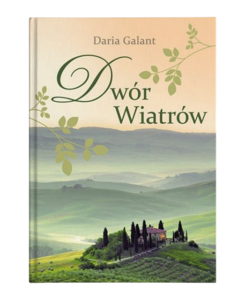 To say about Daria Galant that she is a writer is too little. It is just not enough. Analyzing her writing achievements, you cannot skip the fact that she is also a well-known horse whisperer, a creator of her own educational methods, a poet, a playwright, a teacher, and a journalist … Why is this so important? Daria Galant is an experienced writer who does not abandon her non-literary experience while sitting down in front of a blank piece of paper. She proved this many times by hiding part of her own soul and charm in subsequent novels. One cannot, therefore, separate own life from what is enclosed in the pages of the book. And because there are many things going on both in author’s life and in the book, you can gain a lot by reading Daria’s next novel – the House of Winds. On the front page, there is this information: “it is a multifaceted novel about tangled fates and psychological dilemmas of strangers who unexpectedly start sharing life together by moving to one house”. It sounds banal, too banal for a book so deeply rooted in psychological knowledge. After reading the novel, you can also come to the conclusion that this introduction is “false”, or at least confusing because the book’s main plot is actually one: seeking yourself. Because the house, the narrative and everything else are subordinated to the thought that comes to all people’s minds: how to find your own identity? How to be happy without hurting others? How to live a life when circumstances are against us? Seemingly ordinary questions, however, become not so obvious while reading this book. In a modern, busy world we are afraid to ask such questions, and we are even more afraid of the answers. Therefore, hiding them in the book and wisely carrying the reader through the subsequent stages of reading and initiation is truly valuable. The is divided into twenty-four chapters. But only four of them have their own titles. At the first reading, it gives the impression of a little chaos: we do not know why some chapters have been titled while others have not, and what exactly does it mean. The first chapter is titled -“Ireland. Leinster Province. Modern times “, another (third)” A year later. December”. You have to wait a bit longer for the next title because it is the eighth chapter that we recognize as “Arrival of Chiara”. The title of the closing chapter is: “Ireland. County Leinster “. It is difficult to find a key in these, except one – the first and last titles form a kind of buckle – but let’s talk about it in a moment. The next time you read the book, you get the impression that these headers have been mistakenly placed next to the chapter numbers. They constitute an excellent ordering pointer, they show in which places the action is happening, what is very important, because those two separate places are so similar to each other that one could overlook, in where the action is taking place. And this, in turn, would build a sense of chaos. Speaking of the unfortunate choices, it is worth mentioning that The House of Winds deserves a slightly better editing and more careful typographer’s work. This magical book would have been read even better if it was edited in a better way. “She loved the mirror. It became her ally. But it didn’t speak (…) she felt a bond with it. Ghosts from the mirror were not threatening her at all.”,”The mirror seemed to breathe, to take life from the air that got into the structure of the crystal after removing the dust. It glowed splendidly”, “In the evening, Amelia felt an irresistible urge to be near the mirror. She has not visited it for a long time (…) Knowing that access to the mirror is difficult, she has not visited it lately. Now, however, she decided to do it. She stood opposite the mirror, pushing aside the dams, the satin and the sheaves of hay. A calm sheet of crystal appeared to her eyes. She looked at it with pleasure. These are just a few fragments from the book where the mirror appears. Even the reader who is less-familiar with literature, will recognize this motif as grounded in the fairy tale of Snow White, repeatedly processed, but always in certain frames close to the original. Daria Galant “reworks” the motif of the mirror – certainly using own therapist’s experience – therefore, the seemingly banal and obviously recognizable motive begins to play its own role in the novel. It is no longer an enemy or ally but a wise and sometimes cruel exposer of the human nature. The human past. Because this is what this novel is really about. We need books about pursuing a dream goal, overcoming difficulties and finally reaching a happy end in today’s busy and chaotic world, and certainly we have a lot of these to choose from. The idea, however, to concentrate on extracting what is behind our current life, choices and their consequences is much less common on the market. In the The House of Winds, the motif of searching for the true self is the most captivating. The reader has the ability to gradually and slowly (which is an asset not to be underestimated) move around the next parts of the novel, the author gives him time to think and discover, and the mirror in an empty stable becomes an eloquent sign, a warning sign (though another reading, and finding other accents can bring quite different conclusions). With the help of a mirror, but not only with that, the motif of destination was introduced. It always – whether we like it or not – depends on what’s behind us. The almost psychotherapeutic arguments which are so strongly present in the book are an irresistible proof for it. What methods does the author use to achieve an atmosphere of calm in anxiety, the order in chaos, clear conclusions in seemingly detached human stories? The key here is the mindfulness emphasized earlier, in which narrative structures become the most important, while the action is postponed. This is not Joyce’s stream of self-awareness, but the writer certainly escapes from the schemas used in many novels: sudden changes of actions, suspensions diametrically reversing the fate of heroes. Daria Galant focuses rather on the conscious use of names, the creation of types and characters, and also on an original story, not created under a pre-determined thesis. And so she is rather the heiress of the classic form of writing, rather than popular books. Without revealing the content of the book, it is worth paying attention to one – quite significant, as it seems – nuance: the buckle that was mentioned earlier. The first and last parts seem to be almost the same. However, changing the noun at the name of the action site, seemingly irrelevant, shows how much the author cares about the details, they are important to her, because it is through them that the most important layer of the work was built. Moving away from simple schemes, creating own, subordinated author’s vision of the novel, avoiding the pressure to surprise the reader does not mean that you will be deprived of astonishing moments and finals. It will be especially surprising for those who know Daria Galant’s books well. The author has once again written a novel that does not fit clearly into any schemes, which is also a continuation of previous achievements, as well as introducing a new quality to the novel of the twenty-first century. Is this possible? Readers must find it out on their own. Due to the diversity of genres, the novel has many different tones. It is all created by funny scenes from the life of the women’s magazine editing, captivating images of love fascinations, horse riding on icy roads, guilds, and divination of a village witch, the fire of a manor and stud, etc. At the same time, the novel keeps its full internal coherence. This is due to author’s master skills in the art of writing. The rapid narrative, carried out with short sentences, does not let the reader feeling bored. Factual information about events is accompanied by a range of feelings and moods. The narrator, who in fact is a woman – as so we can conclude due to the specific feminine perceptiveness – has great abilities in valorizing epithets, original, surprising sentences, also metaphorical shots that unexpectedly evoke poetic stylization, sometimes realized in separate small poems, reminding that the author is also poetess. The narrator can with this great ease, almost spontaneously, put into the text vivid dialogues of heroes, highly individualized, as each of these heroes has a distinctive, unique personality. These types of texts allow to built dynamic scenes that do not allow the reader to put the book away for later. Contemporary literature is a sack without the bottom, where you can find everything that comes to mind. This sack is full, but it is not always possible to pick something valuable out of it. While many of the good works from the genres of popular crime novels, and even one could pick out something of the postmodern “novel in the novel” genre, it is difficult to find in this vast bag a novel about love that is worth a glimpse. The last one, that was worth remembering, was “Love in the Time of Cholera” by Marquez. I did not really expect anyone else to write a valuable book about love that with no shame could be located next to Marquez work which, in my opinion, is the most beautiful book in the world. 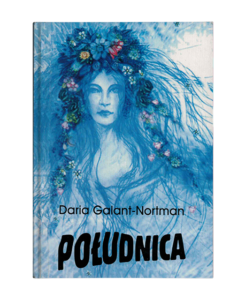 Daria Galant created a unique and beautiful novel at the same time. Having informed the reader, that he may find in this book a reality created in similar way as in Leśmian’s books (at least I thought so after seeing the title), she put into her book the power of imagination, poetic imagination and what I write with satisfaction, a quite a good idea that she had in her head. While reading first few pages I was looking for this specific Leśmian’s style, but I haven’t found them so my first association evoked by the title of the novel was not appropriate. I even had this idea in my head, that it is not worth to continue reading this because there is no chance I will be interested in a pale woman walking through the fields. And at that point, it turned out that there is no option for me to give up on this book. The novel, although developing in a direction unexpected by me, could not let me put it back on the shelf. It was as if this story just stuck in my head and it was not going to leave. There was no chance of any abandonment or postponement. And even though it did not resemble Leśmian’s style at all, it was already enchanting me. A brief analysis showed that I am attracted by a word that guides me through stages and events. Rich, or you can even say “fleshy” language- full of meanings and games with the reader. Dialogues that had some invisible and supernatural magic. Then I reminded myself of another author -who I admired while I was a student. Witkacy- his name was in my thoughts. I know all of these from his novel. Intellectually oversaturated dialogues, the action unfolding as if in a standard, banal like, but behind every line there is a mystery. The secret that grows, swells and blooms. And then Witkacy takes his arm with Leśmian, both supposedly present, giving way to the new vision, patronizing Galant and watching her from the side, like good spirits circling over this whole And on the first plan comes out in full beauty not the pale woman, but sparkling with various colors of talent and ideas -Daria Galant. The author who managed to combine the best Polish achievements in literature with her own imagination and talent. In her novel, there will be something interesting to everyone who values ​​brilliant style and intelligent ideas. But also all those who love folklore and its colors. Because it is difficult to talk about “Południca”. This is not, according to the latest trends in literature, a typically uniform book. The mystery of Witkacy and indeterminacy, as well as the allure of the smelling Leśmian’s meadow, are just some of the keys to the interpretation of this book. But this is not the greatest asset of this novel. The most captivating is, however, the gothic vision of love – true and lifelong, a feeling that is so strong that nothing is able to erase it from memory. Love that is destructive but also cleansing. The author presents love as it is, as a feeling that surpasses all other sensations, so beautiful and delicate, that you can lose as quickly as you find it. This is a book for reflective reading. Perfect for warm evenings spent by candlelight, when flickering candles give depth to every word read, and after some time you can lose the boundary between fiction and reality. And the end, this epilogue, which shouts from the novel’s last page – calm down a little, because something still can happen, something you can be surprised about. And it really does. Last words, just a few lines, and the white, mysterious Południca leans out and seems to whisper, “I have not said my last word yet. Get ready, I’ll be back.” And with this hope, the reader is left. The only question that returns to his head is- when? This book should include a note on the cover: “Warning! This book is addictive”. University of Wroclaw, May 2006.